Eggs are literally one of my favorite! They can be made just by themselves, or be a superglue to the ingredients, gelling the flavors together. The best part? Most egg dishes are super easy and super fast to make! Alright alright, I’ll stop singing praises and get on to the recipe! Add some oil to the pan to get things started. 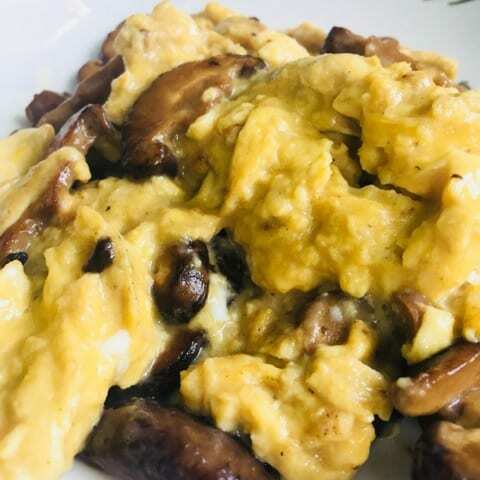 While waiting for the mushroom to be done, pour the pepper and teriyaki sauce into the eggs and whisk them together until no egg white can be seen. Continue to scrap until the eggs are cooked to your preferred doneness (I like my eggs a little wet, but some of you might prefer fully done scrambled eggs). Send it to the depths of your tummy! If you have questions about the recipe, feel free to ask in the comments section below. If you like this recipe, do share it with your friends! More viewership = more motivation for me to write awesome post for ya!